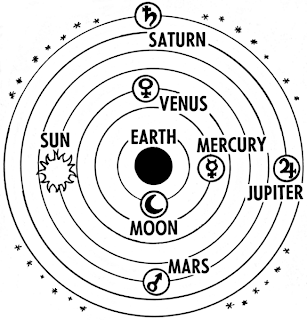 The astronomical system of Ptolemy, in which the Earth is at the center of the universe. 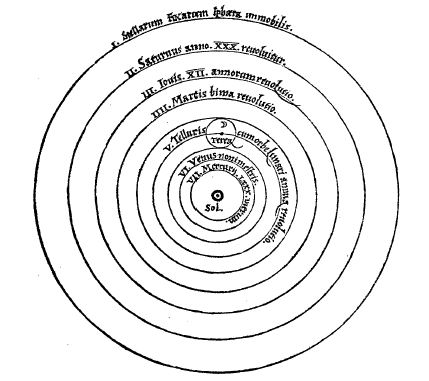 A model of Copernican heliocentrism, published in 1543, in which the sun is at the center of the universe, with Earth and other planets revolving around it. As Copernicus' model followed earlier challenges to that of Ptolemy, so university presses are migrating a new scholarly communications cosmos that follows challenges that came before it. Though we have become accustomed to thinking of ourselves as involved in, or confronted by, a revolution in scholarly communication, I see this moment as more akin to the emergence of a new cosmology of scholarly communication—a time not so much of economic reallocation or technological transformation (though both of those are surely forces) as much as a dramatic expansion and realignment of the megacosm and where all of us—scholars, students, librarians, publishers, tenure and promotion committees, administrators—locate ourselves in it. The most famous shift in cosmology, of course, was that from the ancient Ptolemaic and Aristotelian system in which the sun and the planets were seen as revolving around the earth to the Copernican system in which the Earth was decentered, just one of several bodies orbiting around the sun. Similarly, university press publishers, who could until recently feel that the entirety of humanities and social sciences scholarship revolved around the monographs and journals they publish, now find themselves one of several planets revolving around that sun—others being scholarly blogs, social media sites, digital commons, web-based scholarly projects, library publishing, open access scholarly presses, and the emerging digital humanities. The very universe of scholarly communications has dramatically expanded and it is the challenge for university press publishers, and everyone involved in scholarship, to redefine themselves in the gravitational fields of that new cosmos. 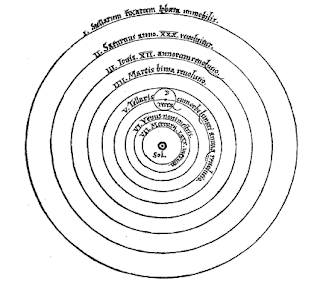 To continue with Copernicus for the moment, we should consider that the Earth did not crumble to dust upon the publication of De revolutionibus orbium coelestium in 1543. Nor will university presses suddenly perish in this new scholarly communications cosmos. What occurred in the sixteenth century is that the decentering of the Earth, and the theological system built around it, made room for new ways of thinking and that is precisely what we are seeing in the rise of digital humanities and the Open Access movement today. It is also important to note that Copernicus’ heliocentric model followed several earlier challenges to the logic of Ptolemy’s geocentric universe. University presses, too, have survived several shocks before this current moment of cosmological shift. Akin to Ptolemy’s long-lived system, university presses stretch back to the antiquity of the North American university. The first book published at an American university was at Harvard in 1636 and the first formal American university press established at Cornell in 1869. Heralding a familiar phenomenon of university publishing operations being closed or threatened with closure, the press at Cornell ceased business just six years later, in 1884, only to be resuscitated in 1930. The longest continually operating university press was founded at Johns Hopkins in 1878, a press that has remained at the leading edge of our profession, co-founding Project Muse in cooperation with its parent institution’s Milton S. Eisenhower Library in 1985 and, in 2011, joining with a broad consortium of university presses to add frontlist scholarly e-books to its invaluable platform. Leading up to and through the New Deal era, university presses were being founded at a rate of about one each year—Minnesota’s in 1925, Indiana’s later in 1950—a rate which continued through to the 1970s, when the end of the federal subsidies for university libraries under the Cold War Era National Defense Education Act began the long slide in library monograph purchases, the “Monograph Crisis,” that gained speed with the “Serials Crisis” of the 1980s, the Open Access movement of recent years and, now, exploded beyond its original boundaries with the “Crisis in the Humanities” today. Arguably, then, university presses have been in some form of crisis since the late 1970s, some 35 years ago. I started my career in university presses in the late 1970s, some 35 years ago. When I started in university presses in 1978 at Columbia, over 70% of our book sales were to libraries with the rest—to bookstores, to individuals scholars and graduate students, for course use, and overseas—seen as “icing.” That “icing” now overwhelms the cake itself, with libraries accounting for only an estimated 20% to 25% of university press sales. Amid this career-long “crisis,” university presses have in fact held their own, with overall sales even increasing by about ten percent over the past, economically difficult decade and ebook sales now rising rapidly—currently quicker than in the publishing industry as a whole. So, given this record of resilience, overcoming adversity and, though we receive little credit for it, innovation, why be concerned about the future of university presses? The reason, as I’ve suggested, is that not only has the world changed—university presses are used to that—but the cosmos has shifted, calling into question the place of presses not just in the university—again, a familiar dilemma—but in a far more diverse, fast-moving, and increasingly decentered system of scholarly communications. The issue at hand isn’t simply print vs. electronic nor even “Open” vs proprietary, copy-left vs. copy-right. These are economic and thus solvable problems. It is, to my mind, the emergence of more informal, iterative, and collaborative scholarly communications vs. formal, fixed, and author-centered—literally: authorized—scholarly publishing. The digital humanities scholar and bot provocateur Mark Sample once hyperbolically referred to this dichotomy as Muppets vs. Highlanders; he was joking, but he wasn’t far from the truth. I believe we need both these informal and formal systems. The challenge before all of us is to integrate the two, to make them interoperable, and university presses have, I must admit, been slow to acknowledge, much less accept, this expanded scholarly communications universe, one that increasingly orbits around scholars with multiple and diverse publication choices rather than fixed, comprehensive library collections of peer reviewed monographs and journals. If, with the rise of this new cosmological system, the university press establishment has not been been burning its heretics, we have also not yet heeded them.